After Alexandria Ocasio-Cortez won one of the the most surprising primary upset in decades, pundits scrambled to make sense of her win and what it meant for the future of the Democratic Party. Sadly, however, takes travel halfway around the world before voter file analysis is available. Using voter file data, we can analyze her victory in depth and in the context of other progressive over-performers: Suraj Patel and Adem Bunkeddeko. The data suggest these impressive electoral performances were propelled in large part by young voters. The election of Ocasio-Cortez shows that when young people engage, they have the power to make a real difference. The problem, though, is that some states, like New Hampshire for example, have passed legislation making it harder for students to participate and vote. New York State lags behind its peers in making it easier to access the ballot box: The state does not have automatic voter registration, election day registration, or even early voting. Voters wanting to change their party affiliation have to make that switch more than eight months before the election (no other state comes close). Primary elections are scheduled for late June, when many students are away from the summer or not plugged into their school communities (where get-out-the-vote operations are most robust). And unlike any other state in the country, New York has different dates for local and federal primaries which adds a further layer of confusion. 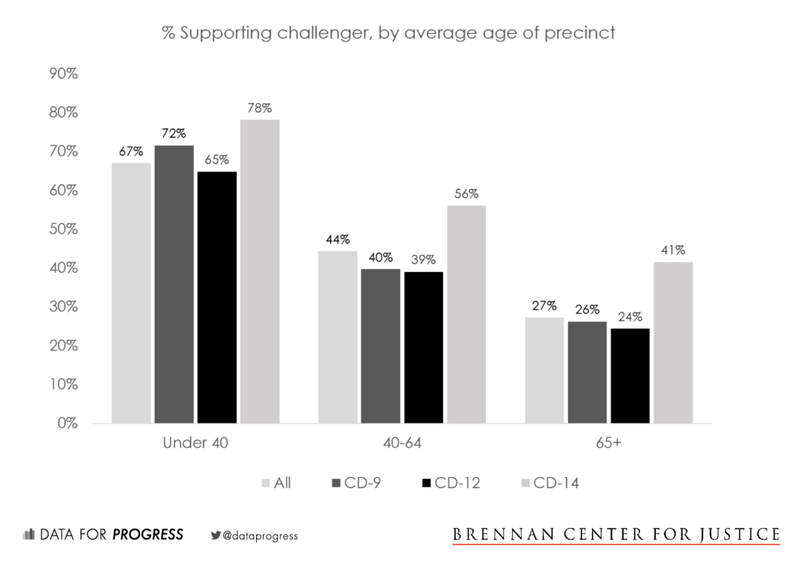 Despite those barriers, the data we analyzed show young people turned out for the Democratic primary in New York’s 14th district (spanning neighborhoods in the Bronx and Queens) on June 26. It’s likely that their support made the difference in her double digit triumph over the incumbent, Representative Joseph Crowley. Ocasio-Cortez won nearly nine out of ten of election districts where the average age of the voter was below 55, but she netted less than 40 percent of those where the average voter was 55 or older. Younger voters still had relatively low turnout rates: just 11 percent of active registered Democrats in the 14th under the age of 40 voted in the primary, compared to 15 percent of voters 40 and older. However, because their support for Ocasio-Cortez was so concentrated, even this turnout rate likely had an impact on her victory. New York’s 9th district, covering much of central Brooklyn, also had a primary election on June 26 in which younger voters roundly supported a challenger to a long-time representative. Adem Bunkeddeko, a 30-year-old native of Queens, challenged Representative Yvette Clarke who has represented the district since 2007. Although Bunkeddeko lost to Clark, the margin was a slim four points (52 percent to 48 percent). Here again, his electoral strength was largely driven by younger voters, who supported him substantially more than older voters. Despite their preference for the challenger candidate, younger voters didn’t turn out in the 9th district the way they did in the 14th (where Ocasio-Cortez scored her win). In fact, just 8 percent of actively registered Democrats under 40 cast votes in the primary election. If they had matched the 10 percent turnout rate of their older neighbors (or maintained their turnout numbers but registered more residents), the primary result might have been different. Suraj Patel similarly challenged incumbent Democrat Rep. Carolyn Maloney in New York’s 12th district. Patel, too, was widely supported by younger voters in a district that crosses three boroughs (Manhattan, Queens, and Brooklyn). Patel won 55 percent of the election districts where the average voter was under the age of 55. He won just 4 of the 280 election districts where the average voter was 55 or older. Although turnout in the 12th was higher among young voters than in the 9th or the 14th (13 percent of registered Democrats under 40 cast a ballot), so too was the turnout rate among older voters in the district. In fact, the turnout gap between older and younger voters was highest here. Furthermore, while younger voters supported Patel substantially more than their older neighbors, that support was not nearly as concentrated as it was for Ocasio-Cortez. First (any maybe obviously): turnout matters. In this batch of three primaries, turnout was barely over 13 percent for all registered Democrats. Second, the turnout was even lower among younger voters. More than 14 percent of registered New Yorkers over 39 turned out in these contests, compared to less than 11 percent of those under 40. This turnout disparity is magnified by the equally problematic registration disparity: citywide, a paltry 57 percent of New Yorkers between 18 and 40 are registered to vote. More than three quarters of New Yorkers 40 and older are registered. If younger voters had registered and turned out at the same rate as their elders in these congressional districts, younger voters could have collectively cast some 25 thousand more votes in these three contests, potentially changing the results of all the elections. Additionally, just because some voters were able to turn out, does not mean barriers to voting are inconsequential. We should be concerned whenever individuals’ access to the ballot box is impeded regardless of any electoral outcomes. Of course, we can’t know how many votes went uncast by young New Yorkers thanks to structural impediments, and how many went uncast because of political disengagement. We do know, though, that restrictive voting laws can heavily impact younger voters. Research shows that voting is a developed habit – each time a voter participates makes them more likely to participate in the next election. A robust democracy depends on getting young voters to establish casting a ballot as an important part of their involvement with their community. Sometimes, their participation will contribute to decisive electoral victories, and other times it won’t. But regardless of any electoral impact, young voters – in New York and around the country – deserve free, fair, and accessible elections just like other citizens. Kevin Morris (@ktnmorris) is a Voting Rights Researcher at the Brennan Center for Justice.